Junk generation is a term I picked up from Tom Adams, but I'll attempt to define it: generation that exists to meet a proponent's need for revenue, not a consumer's need for power. Like, for instance, industrial wind turbines in Ontario. The past two days were the hottest of the year, with demand averaging 28% more than it has thus far into 2013. 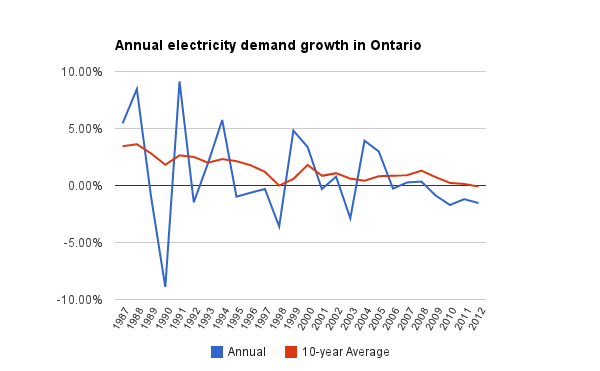 The Ontario Power Authority's 2013 Q1 Quarterly Progress Report on Contracted Electricity Supply indicates that the majority of supply contracted to come online prior to 2017 is industrial wind turbines: supply that is particularly unreliable in the peak demand summer season, but is also not reliable during the secondary peak winter season. Another 21% of already contracted supply is solar, which makes no contribution whatsoever to winter peak demand. Because over 80% of the supply the government is stupidly proceeding with can't be dispatched to meet demand, while the coal that can be dispatched is marked for death at the year's end, something must be done to deflect from the lousy bet on industrial wind. With no desire to act responsibly and cancel all wind projects not yet though the entire approvals process, the Ministry of Energy is sabotaging it's next Long Term Energy Plan by returning to nothing - which they refer to as conservation. Now, conservation, and demand management (CDM) are genuine things that deserve a genuine measurement against other options (which I'll get to some other time) - but they are also a tool of the bureaucratic fop to expand empires. It's Groundhog Day, redone for an Etobicoke crowd. For bureaucracies to do what they do – expand - they needed to grow despite the decades old trend now resulting in declining consumption. There is an assumption that bureaucracies intend to do good, but there also Parkinson's law that dictates bureaucrats will make work to take up as much time as possible. CDM is beautiful because it's complicated. The most logical reason for non-energy to be the centerpiece of a 'long term' energy plan is in it ensuring continued employment for long-term planners. If the success of a coming together of bureaucrats is in establishing more coming togethers, the performance is impressive.